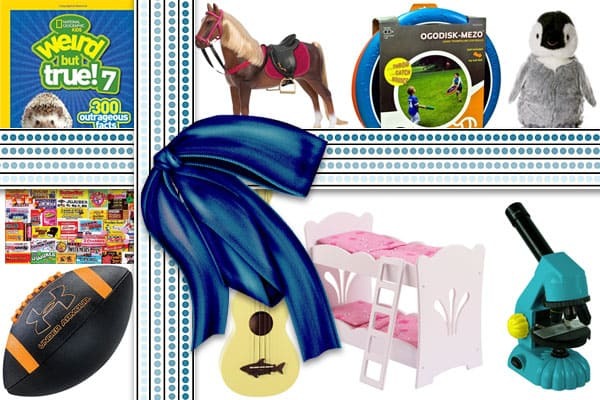 Mel’s Mini Gift Guide: Kid Stuff! I’m back with another fun, little gift guide today! If you missed last week’s game guide, check it out here! Thanks for all your fantastic comments on that post – tons of new ideas, and I’m glad to know that the games I recommended are favorites for many of you, as well! Remember, you can check out ALL THE GIFT GUIDES I’ve ever done right here for tons of other great ideas. 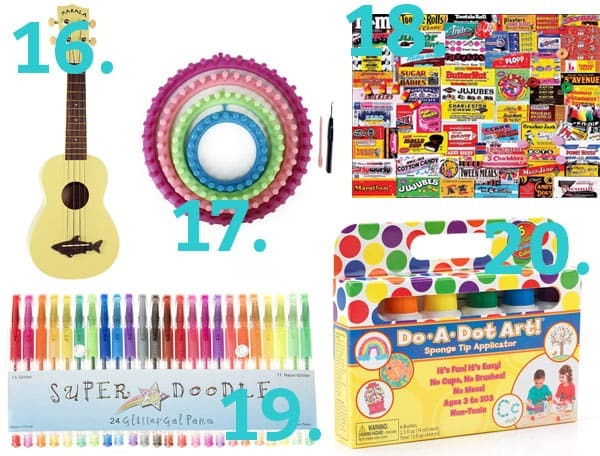 Specifically, here’s another great kid gift guide. As always (sorry to repeat myself, but I like to reiterate this in case anyone is new here), none of the items in any of my gift guides are sponsored; they are simply things we’ve bought (or been gifted) and loved on our very own. I only share the best of the best. Today it’s all about kids! 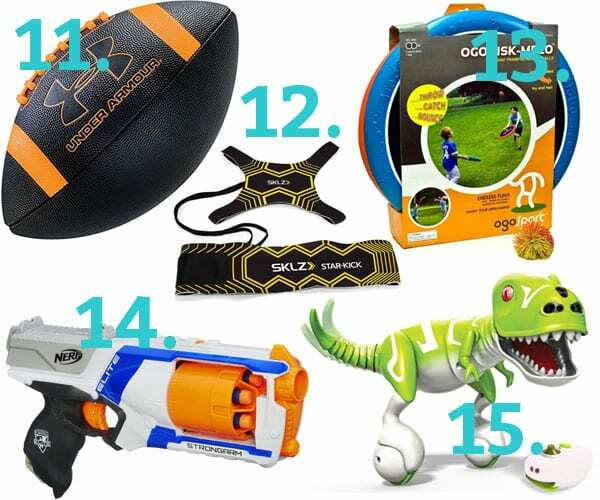 This gift guide (and other kid gift guides I’ve done) is obviously tailored to the kid structure we have at home: four boys ages 12, 11, 9, 7 and one little girl, age 4. So if you have any kids in those age ranges, hopefully some of these ideas will get the gift-giving juices flowing. Please note that there are Amazon affiliate links below for products I’ve bought from there. If you don’t know what affiliate links are, it simply means I receive a small commission if you purchase from the affiliate links below with no extra charge to you; as always (and I really mean this), feel free to shop around for the best deal. I’ve noted in the details below various places where I’ve found the items on killer sales during the holidays. 1. Our Generation Play Horse. Cam wanted one of these sooooo bad last year after playing with them at a friend’s house, and I’m happy report that after receiving one for Christmas, she still plays with it almost every day. Moment of silence for that wonderful fact (say no to toys that only get played with for less than a week). I bought her horse at Target with a $15 off coupon last year (the ones that come in the mail) – they are a little more expensive on Amazon. 2. Doll Bunk Beds. Bunk beds for dolls? Not only is this concept adorable, but it’s convenient for Cam’s stockpile of dolls…you know, so they have more than one bed to use. Very important when one is going on their 5th hour of playing house. 3. Flopsie stuffed animals. Be honest, do stuffed animals make you smile or cringe? I’m a stuffed animal lover (ahem, for the kids), and these Flopsie creatures are some of my (ahem, our) faves. I mean, look at Penny Penguin? Is she not the cutest thing ever? 4. Dress Up Shoes. It goes without saying that there’s a lot of dress-up happening in this house by one little girl in particular. She has several dresses that get put on, taken off, put on, taken off…over and over and over…but it’s the shoes that are the real favorites. These ones by Melissa and Doug are the best little shoes. 5. Friends Legos. Considering Legos have been a staple toy in our home for years and years, it was inevitable that a little pink and purple action was going to surface eventually. These Legos are on Cam’s Christmas wish list after playing with them at a friend’s house – this airplane set is pretty fun, and we’re hoping Grandma comes through with the adventure set. 6. Laser Tag. The boys got a set of these guns last year for Christmas from their grandparents, and honestly, I was doubtful they’d hold up for long, but they continue to be one of the most oft-played with toys when friends come over, and I’m pleasantly surprised at how rarely I have to dig out new batteries. 7. National Geographic Weird but True Books. We love books and we love random, weird facts. These books are a match made in heaven for our family (adults included!). My boys pore over these books. We have the collector’s set of 900 facts (because seriously, why not? ), but the books are available as singles, like this one. 8. Microscope. My 9-year old got this microscope for his birthday last summer, and he is still digging up (literally) the most disgusting things to look at underneath the scope. The kit comes with a few samples to examine, but if your child has an imagination, be prepared for lots of – well – interesting science experiments with this thing. For a starter microscope, it’s definitely doing its job and providing hours of discovery (says the mom who just got called over to view the latest spider specimen). 9. The Cube. Yeah, I know, isn’t this basically a Rubix Cube? Well, apparently, this is the new and improved (easier to twist) cube, and my middle schooler will tell you that the hundreds of kids walking around his small campus with their cubes would agree. He plays with this nonstop and has had to be reminded more than once that The Cube is not allowed at the dinner table. 10. Bunch O Balloons. I know it’s winter in many parts of the world right now, but these water balloons are insane, and totally fun, and worth saving for the summer or filling up in the bathtub (at your house, not mine). Another birthday gift from the summer, we all were worried these wouldn’t deliver as promised. Wrong, wrong, wrong. Apparently filling 100 water balloons in less than a minute is one of the funnest things we’ve done all year (surpassed only by throwing them at each other). 11. Our Favorite Football. We have a lot (a lot, a lot, a lot) of footballs roaming around our house and garage, but this is one of the best and really the only one the boys play with in the yard and in our bonus room (and yes, I’ve lost the battle of “no throwing balls in the house” – four boys will do that to you). a solo soccer trainer…and it’s awesome. Not only has it been great for him to practice his soccer skills, but it’s also been used for some pretty inventive, clever games by he and his brothers (that usually end in tears, but that’s not really anything new). 13. OGO Sport. Another super simple, fun, sporty gift – we love these OGO sport discs! Not that throwing a ball to each other is that hard, but this takes it to a whole new level as you launch and catch balls with these trampoline-like discs. Soooooo fun! 14. Nerf N-Strike Blaster. Nerf guns will always be a staple in our house (seriously, probably even when the kids are grown), and this is one of our favorites. So favorite that we have four of them, which means a) no arguing and b) lots of epic nerf fights. 15. Zoomer Dino. We caved to the Zoomer Dino craze last year, and I, once again, was proven wrong…this crazy little remote-control dinosaur is still played with all.the.time, and is one of my 7-year old’s favorite toys. I got it on a really stellar sale at Kohl’s last year (couldn’t find a link online so I don’t know if they are carrying them this year), and with their additional coupon savings, it was ridiculously low priced, so keep an eye out for sales. 16. Ukuleles. Possibly one of the best gifts of all time, we gave one of these colorful and highly-reviewed ukuleles to my 2nd oldest for his birthday over a year ago. It was so popular that two of the other boys requested one for their birthdays after that. So now we have a yellow, green and blue ukulele (and Brian has his own mahogany one, too); just tonight my 11-year old was strumming some tunes, and I couldn’t believe how much he has learned and what he can play! This Ukulele for Dummies book has been invaluable (as well as lots and lots of playing time). 17. Circle Looms. Call us old-fashioned, but my boys (especially the younger ones) love to make things (mostly scarves) on these awesome circle looms. I picked mine up at Hobby Lobby (hello, most wonderful 40% off coupons), so look for them there if they are still available. These looms always come out when we watch a family movie, and I have some rockin’ scarves hanging in my closet to show for it. 18. Candy Wrapper Puzzle. Just like games, we are obsessed with puzzles. We do a new one every year during the Christmas holidays, and it’s probably one of our favorite traditions (we actually have a puzzle up in the computer room a lot during the year, too). I’m considering opening up a “puzzle library” or exchange because we have so many (local friends…come see me). This vintage candy puzzle from White Mountain is one of our all-time favorites. I highly recommend White Mountain or Ravensburger puzzles. 19. Glitter pens. Because crayons are like, so last summer, the kids usually use these glitter pens to draw and color, and I’m surprised at how long they’ve lasted, especially since they are constantly doing art projects. You should see some of their artwork. It’s legendary (and piles up all the time…sometimes I have to find creative ways to display, and yes, dispose, of all of it). 20. Dotters. Speaking of artwork, if you don’t have dotters, WHERE HAVE YOU BEEN? The best little art tool for young and old, dotters are some of our absolutely favorites. We’ve had a set for almost four years, and they are just barely beginning to show signs of failure. Dotters rock. That is all. I’d love to hear some of your favorite gifts for kids…share, share, share! Oh darn it, that’s a huge bummer! I was looking to get our 6 year old a set of those orange soccer nets you mentioned in a pervious gift guide but I was curious to know what size you had. They have 2.5 ft, 4 ft, or 6 ft to pick from. Seems like the smallest ones would be tiny but just thought I would ask! I’m pretty sure we have the 4 footers. Thank you for responding! I appreciate it. Mel! What was that spinny game on Instagram!? They’re not taking anymore orders for Christmas delivery 🙁 Next year! I love your gift guides! I would love your suggestions for in-laws. I have the hardest time thinking of gifts for my husband’s parents! Besides the girl stuff, we have a lot of the same toys! One favorite that’s not on your list is a glow in the dark football from Nerf. It probably gets used more than the regular ball, at least in the winter when it’s dark at 4pm. Thanks for the list! This is an awesome list. I, too, have one girl and five boys, and I can second the doll bunk beds, the microscope, and the nerf guns. This year all my boys are getting some fun, colorful dress socks. Seems to be the cool thing these days. So many great ideas for my kids who line right up with yours and have similar interests! Thanks for your great gift guides! 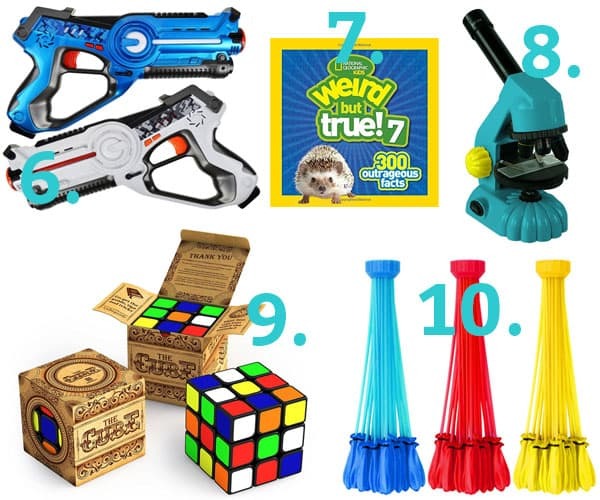 Thank you – each year I wait for these lists and inevitably I always find something I must get for my kids, particularly my 8-year-old boy. He LOVED the nerf bow and arrow. And your games list was great too – we are definitely board gamers here. I look forward to your guides every year, and many of your recommendations find their way on to my gift list..my grandkids are grateful! You’ve never steered us wrong. Thank you so much, and Merry Christmas! Oh, love this!! So many great ideas! I just put up my own list in my blog with all the books and toys that my six kids have loved most, and we have no overlap. So hopefully you’ll find some good ideas there too! 🙂 Thank you for posting yet another great gift guide!! Love the suggestions, love the tips for where to get the gifts. Thanks!!! Every year I wait to do any Christmas shopping until I read your lists! They are invaluable to me, and have provided me with timeless, amazing gifts year after year!!! I have 2 boys, 6 & 12 and 2 girls, 9 & 4- and your lists are always perfect!!!! The comment string about kids Christmas gifts on MEL’S website is hardly an appropriate place for YOUR political opinions. Good grief! Get off your high horse. That was meant for Sally! I like Hobby Lobby because they actually are closed on a weekend day. Having worked in retail, I appreciate the fact that they are the one chain retail store that lets workers spend a day with their families. That means a lot to me. And I’m sure it does to the workers also. Aside from the fact that they are always polite helpful and friendly. I (and most people I know) don’t shop there either, but there are many secular craft store options from chains to sole proprietors to patronize. We’re lucky to have shopping options and great lists like this to help us out! Yay! I have 4 boys as well. Great list, Thanks for sharing these! 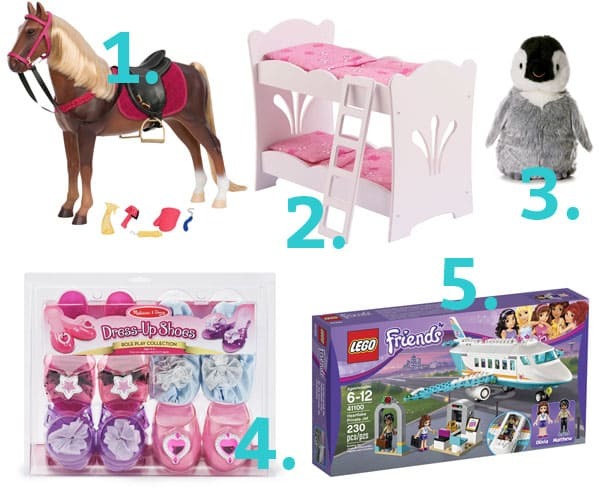 I think this is my favorite gift guide ever! I just bought 5 things! Another fun outside catch type game that is LOVED at our house is djubi. Thank you for this fabulous list!! I put almost half of it on my Amazon shopping list. You have great ideas. I already ordered several games from your guide and will definitely add the football to my list. We have many of these toys from your list. You are spot on! I have 3 boys and love outside toys (for inside we have lots of Nerf and Legos). They have a Slackline and love the show American Ninja Warrior, so I am getting Ninjaline accessories. I hope they love being Ninja Warriors. Hey Sheila – we DO think a like because my boys are getting a slackline this year for Christmas. 🙂 They are huge fans of American Ninja Warrior. My daughter had asked for a slackline. Do you have any good recommendations? I’ve been looking and there are so many options. I’ll ask my mom, she and I were talking about it the other day, and she had some great ideas. We have the Slackers brand and it has been great for 3 years so far. A second vote for Slackers. My kids live it. What a wonderful list! I’m not gonna lie though, I got a little choked up looking through this. My babies range from 14-20 now and I MISS the days when they did things besides sit on their phones and wanted anything for Christmas besides money haha enjoy these precious years.